How secure do you want – or need – your message to be? Nowadays, emails, Messenger, Whatsapp and electronic communication have completely modified our way of conveying information. But let’s go back in time, before the invention of the envelope in the 19th century. How would you securely seal your message? 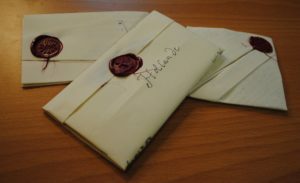 Freshly sealed letters… content is top secret. Why does this matter? As conservators but also curators, archivists and researchers, we frequently come across letters (opened or not) during our day to day work. These documents usually bear evidence such as holes, slits, creases, torn or skinned paper, dirt or wax fragments. From a preservation point of view, understanding these marks can bring precious information about the documents, such as how they were previously folded, information about the sender or the security level of the message. This knowledge as a result will guide the conservation and repair of these artefacts. 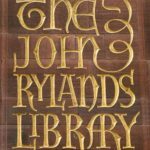 This practical workshop about letterlocking was organised by the John Rylands Research Institute in Manchester on the 14th of June. 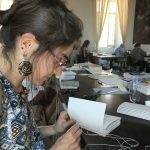 Jana Dambrogio, conservator at the MIT Libraries in the US and Dr Daniel Starza Smith, Lecturer in Early Modern English Literature at Kings College London, shared their knowledge and research about letterlocking. This amazing workshop was highly informative, and I will never look at a letter in the same way as before. This training was also so much fun, and I couldn’t resist buying some wax and a stamp to start playing around myself! So, how secure do I want my letters to be? I would like to thank Jana Dambrogio, Dr Daniel Starza Smith, the John Rylands Research Institute and the University of Manchester to have conducted this workshop and allowed me to attend it.